What Colleges Should Be Doing with Open Educational Resources, At Scale! Today we’re honored to welcome TJ Bliss, Program Officer, Education at the William and Flora Hewlett Foundation to share with us the learning the Foundation has garnered in over 15 years of supporting open educational resource projects. Thank you, TJ for sharing how to scale OER with your cooperative! The William and Flora Hewlett Foundation has been supporting Open Educational Resources (OER)[i] since 2001, when the president of the Massachusetts Institute of Technology requested support to make the content from MIT’s roughly two thousand courses available freely online. This landmark investment resulted in the MIT OpenCourseWare project (MIT OCW). Soon thereafter, Hewlett supported the establishment of Creative Commons[ii], which is an organization that develops and releases licenses for any copyrightable content, including instructional resources in higher education. In the intervening years, Hewlett and other private funders have invested at least $120 million to support the development and dissemination of OER throughout the world and at all educational levels. [iv] This investment has resulted in remarkable progress, especially in higher education. The extent of coverage for higher education from MIT OCW and its many translations into different languages is enormous. More than 100 million unique visitors, including scholars, teachers, and students, have explored content on the MIT site, and millions more who speak and read in languages other than English have visited the sites of the 250 higher education institutions from all over the world in the Open Education Consortium, which grew out of the MIT OCW project. As another startling example of the impact of OER in higher education, OpenStax College, which began as Connexions and was one of the first Hewlett OER grantees, has successfully developed high-quality, openly licensed textbooks for the 16 highest-enrolled college courses. These books have been adopted by faculty in 20% of all U.S. colleges and universities, and these adoptions have saved students nearly $40 million[v]. Many other important open-textbook and open coursware efforts continue to gain traction throughout the world. Despite these incredible accomplishments, many in the OER community are not satisfied with just encouraging adoptions of open textbooks by individual faculty for individual courses. 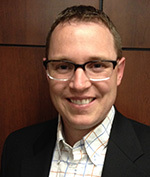 A growing movement has begun around the idea of entire degree programs based on OER. The first successful implementation of such a program occurred in 2013 at Tidewater Community College in Virginia. Dubbed the “Z Degree,” faculty and administrators at Tidewater worked together to adopt and adapt OER for sections of every required and most elective courses in their two-year Business Administration program. Students at Tidewater can now complete this degree program without ever paying for a textbook – a total cost savings of nearly 25%. 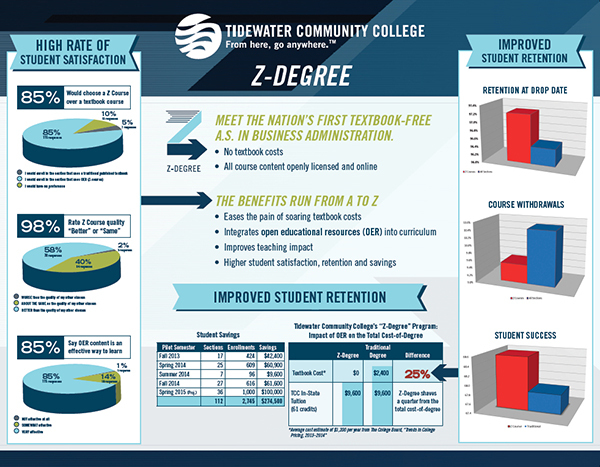 More importantly, students in the Tidewater Z Degree have completed their courses at higher rates and faculty have reported high levels satisfaction with the opportunity and support they received to redesign their courses. The idea of the Z Degree has begun to spread throughout the North American continent, most notably within the broader Virginia Community College System itself. On the global front, the OER Universitas is working to create a general education degree that is fully articulated across more than 30 institutions in countries ranging from Russia to South Africa to New Zealand. An OER-based Degree Programs At Your Institution? To help catalyze efforts to establish OER-based degree programs like the Z Degree at Tidewater, the Achieving the Dream National Reform Network has just announced a new initiative that will provide funding and technical assistance to community colleges and community college systems throughout North America who desire to establish such programs. The Hewlett Foundation is actively considering major funding for this initiative, along with several other funders, as we believe in the power of OER to transform both teaching and learning in higher education. At minimum, the OER-based degree increases college affordability and access to all students, and especially to the most disadvantaged students. Increased access and affordability is likely to increase student completion rates as well. Beyond this, however, there is growing evidence that when faculty adopt OER (whatever the initial reasons) their engagement in course design and attention to pedagogy increases. This is especially true when faculty receive technical and pedagogical assistance from instructional support centers, campus libraries, and other experts. [i] The Hewlett Foundation defines OER as “teaching, learning, and research resources that reside in the public domain or have been released under an intellectual property license that permits their free use and re-purposing by others.” This definition comes from a meeting of developing world nations at UNESCO in 2002, where the name “Open Educational Resources” itself was also adopted to describe such content. [ii] Hewlett considers the Creative Commons Attribution (CC BY) license to be the license of choice, allowing for maximal reuse and repurposing of copyrightable educational resources while still acknowledging the creative work of the developer. [iii] See http://press-pubs.uchicago.edu/founders/documents/a1_8_8s12.html for the full text of Jefferson’s remarks. [iv] This figure doesn’t include the billions of dollars invested by the U.S. government in the community college courseware grants known as the TAACCCT program or any other government funding for OER throughout the world.